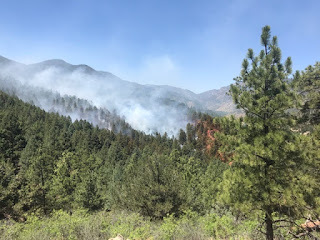 Firefighters have 50% containment at this time and there goal is to strengthen the fire line to gain full containment by end of today's shift. Resources on fire consist of a one 20 person crew, 2 engines, 2 Custer County water tenders. Fire fighters will continue to construct fireline into the late evening and will return early morning to staff the #Hardscrabblefire. No reported containment from the incident Commander. Fire crews constructing fire line, all aviation resources have been released. #Hardscrabblefire size has been adjusted to 2 acres. Next update will be at 6:00 pm. Correction Custer County ordered a pre- evacuation for 10 homes because of the #Hardscrabblefire. There are no evacuations in place at this time. Custer County ordered evacuation for 10 homes because of the #Hardscrabblefire. Large Air-tanker dropped 4000 gals of fire retardant and is currently on hold at the Pueblo Airtanker Base. One Type 2 helicopter has been ordered and is close to being on scene. The fire is in steep rocky terrain and is close to Hwy 96. Location: Custer County, San Carlos Ranger District, 3 miles South West of Wetmore CO.
Resources: 6 Forest Service Engines and multiple cooperative resources on site, Aviation resources, 1 Large Airtanker, 2 SEAT, 1 Type 2 Helicopter, 1 Air Attack and two 20-person hand crews.